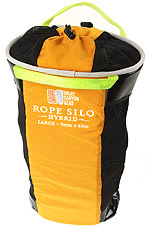 Imlay offers four sizes of rope bags for different lengths and diameters of ropes. The ROPE SILO is our most sophisticated model, and sized to fit 200 to 300 foot ropes. 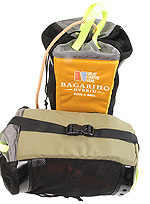 Somewhat less fancy, the BAGARINO offers good performance for ropes up to 120 feet (9.2mm) or 150 feet (8mm or 8.3mm). 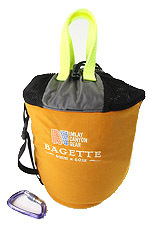 The BAGETTE is made for a 200' 6mm Pull Cord. All our rope bags feature some floatation, flow-through mesh for instant drainage, and a flared-to-the-top shape and stiffened rim to make stuffing the rope easier. Floppy yellow tubular pvc bag? (Sigh) - how 1990's! SHAPE The shape is oval, and tapered - larger at the top, funnel-like. For a given volume, this allows a bigger opening for your hands to stuff the rope into. The non-cylindrical shape adds to the bag's stiffness, aiding it in standing up and staying open. The top cuff (weasel-neck, drawcord sleeve) is also flared, so it can A. fold out and over the top (larger sizes) or B. be held out and form part of the stuffing 'target' (smaller sizes). 2. if the approach is long, coil the rope and carry the Silo separately. Make the rope coil a shape and size that fits well on your pack. STIFF IS GOOD! The rims on all our bags are stiffened, to stay open and out of your way when you are shoving your cord into the bag. The Silos use a stiff nylon wire which is RIGID! The Bagarino and Bagette tape the top rim seam using 1" strap - not as stiff as the nylon wire, but (for their smaller size) enough to get the job done. IT DRAINS! In and out of potholes and swims, the rope bag needs to drain. Half the exterior is coarse nylon mesh, so these puppies drain great. USUALLY Foam is incorporated into the design to stiffen the panels and empower single-person stuffing. It also provides floatation, enough float to keep MOST ropes that fit in the bag on the surface. YMMV. (Some ropes out there are peculiarly heavy and will sink em). TIE IN POINTS Different strokes for different folks, and folks have different rope-tie-in schemes. For me, I like poking the end through the bottom grommet and triple-girth-hitching it to the bottom strap. That way the bottom end of the rope is always accessible in case I need it. There is a mid-height tie-in loop for those who want to keep that end inside the bag; and two handles PLUS an inside top-rim loop at the top. All handles and tie-in points are two layers of burly webbing for long life and prosperity. Our largest rope silo, the Large is made for 200 feet of 9.2mm cord or 300 feet of 8.3mm. A plastic wire stiffens the rim and foam front and back hold that rim up for quick and easy stuffing. Lots of mesh for drainage, lots of foam for floating, lots of tie points for tying. A premium ride. Shorter than the Medium, but otherwise the same. A big, oval target to shove the rope into, flared to the top to make stuffing and carrying easier. Made for 200 feet of 8mm or 8.3mm rope. Stiff rim, mesh, tie points galore - all the deluxe features for a deluxe rope management tool. 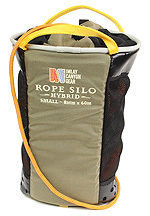 In many canyons, the "working rope" is a shorter rope that is easier to manage, easier to carry, easier to toss around. 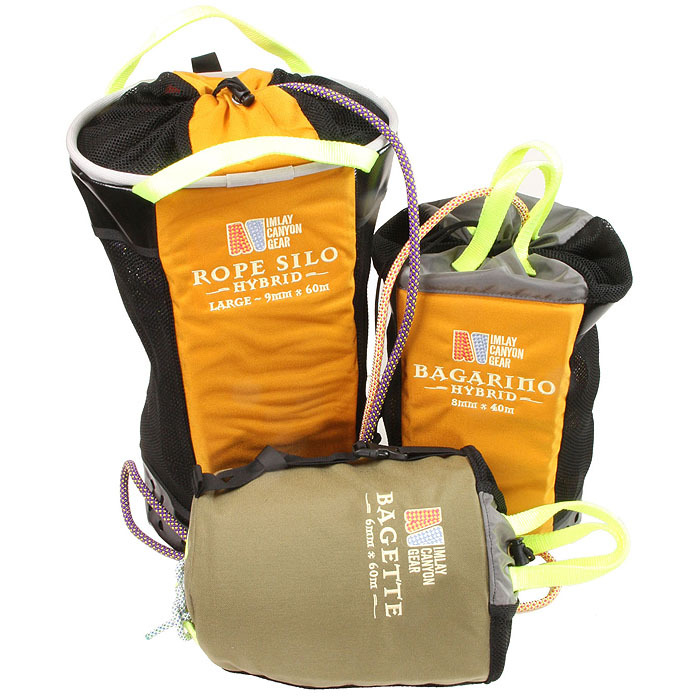 The Bagarino is great for the working rope, being sized for 120 feet of 9.2mm (maybe 150 feet of 8.3mm); and smaller/lighter than a Silo, but still with a stiffened rim, lots of mesh, foam and tie points. Center-clip strap allows it to be worn as a fanny pack for speed canyoneering!